Apparently, Metal-E-Zine is getting a bit more, um, famous. For the past few weeks I have occasionally been receiving unsollicited releases from abroad. 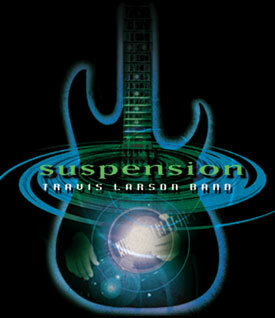 "Suspension" by the Travis Larson Band is one of those. Cheers! The band plays instrumental rock with a heavy emphasis on Travis Larson's guitar work. Emphasis on guitar, I say, but it is evident and clearly audible that the other band members (bassist Jennifer Young as well as drummer Dale Moon) complete a very talented bunch of musicians. "Suspension" contain twelve songs, from ballads ("Sandusky Trail") to more proggy instrumentals ("Crosstalk"), the radio-friendly "Full Suspension" to extremely laid-back beyond-ballads ("Touch" and "Times Like These"). The music is not very spectacular in a flashy way, rather extremely well done, capably written and not too blatantly inspired by any of the known guitar gods (with the exception, perhaps, of some Satch touches I heard in "Frantic Manic"). "Suspension" is a very pleasant album. If you want to hear all-out guitar onslaught, get an Yngwie Malmsteen album. If you want a cool guitar album you could do a lot worse than the Travis Larson Band. The press release and album itself put a lot of emphasis on the guest contribution of Victor Wooten (of the Flecktones). This is all nice and dandy, of course, but I don't understand all the excitement when the band members themselves already quite have what it takes. Besides which, listening to Wooten's playing has not kicked Stuart Hamm from his #1 position in my personal list of favourite bass players, but that's another story altogether.